Greet guests with this beautifully designed entry cabinet. The spacious storage offered by two drawers and dual hidden shelves ensure your halfway will be neatly organized at all times. 36" W x 15" D x 34 1/8 " H.
Display your love for the British flag with this 3- drawer cabinet. A fun and exiting addition to any room, this piece features matching knobs supported by sturdy wood construction. 31" W x 15" D x 35" H.
This contemporary storage cabinet has it all: plenty of shelf space, hooks for hanging coats, bags, and jackets, a mirror, and a cork board. The swivel base offers additional convenience and mobility, while the sleek finish is simple and fits in with every design style. This swivel cabinet will add function, practicality, and style to your living room or bedroom. 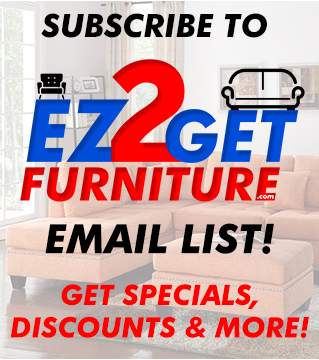 Perfect for dorms, apartments, or office spaces! 20.5" L, 20.5" W, 69" H.
Get an all-around display of your prized possessions with the Hexagon Shaped Curio Cabinet. Surrounded with glass panels and three glass shelves inside, the cabinet makes it easy to see everything as they were meant to be seen. 24" L, 24" W, 63.5" H.
This attractive curio fits right in the corner of your living room or dining room, showcasing fine china, books, art pieces and whatever you want to put on display. Four doors and breakfront molding create visual balance and variety. Warm brown oak and windowpane-style door fronts convey a charming, timeless simplicity. 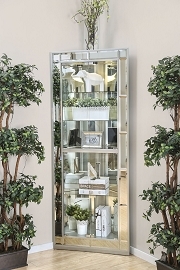 Impress your guests with this beautiful display case. 23.5" L, 14" W, 52.5" H.
Utilize that empty corner in your dining room with this lovely corner curio. With a deep, rich brown finish, it is simply constructed, adding just the right amount of detail to any room. A beautiful acanthus leaf top design lends textual interest, while five shelf spaces behind a wood framed glass door make it easy to put your favorite home accents on display. Traditionally styled with subtle details, this curio cabinet is a classic piece to add a touch of formality and polish to any room. 28" L, 16" W, 72" H.
This elegant curio cabinet has a contemporary feel with the square shape and cappuccino finish. The top features glass panels allowing you to view in from all sides and two glass shelves for display. The bottom is open with an x shape wine bottle holder.19.25" L, 15.5" W, 69.5" H.
This glass curio cabinet takes a contemporary approach to the traditional curio cabinet. 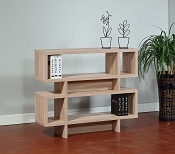 Balanced in design, it features four shelves to put all of your favorite decorative items on display. A cappuccino top and bottom adds a hint of visual intrigue to the otherwise simplistic piece, and a rectangular box shape makes it easy to place just about anywhere in a room. Place in your home office, dining space, or living area and present your home accents in style for people to see from all angles. 16.75" L, 14.25" W, 63.75" H.
This display case will gives lots of room to store and display your finest small sculptures, vases, and art work. Protect your favorite pieces behind strong tempered glass doors and on five sturdy glass shelves. A sleek black frame creates a simple accent that is stylish and contemporary for your modern home. Easy push-to-open glass doors leave hardware to a minimum. This design is also available in three or four shelves. 23.75" L, 14.5" W, 64.5" H.
Add Hollywood glam to your dining room with this stylish curio cabinet. Three shelves and two drawers make it easy to display your china and valuables perfectly, while the interior lighting shows them off like never before. Stacked bun feet, framing and mirrored details, and a Metallic Platinum finish all combine for a look you are bound to love. 44" W x 17.50" x 78.25"H.
Maximize your dining or living room space while utilizing vertical and corner space ! This curio set features glass shelves, metal racks, wood cabinet space ! 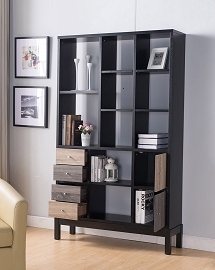 This tall curio set features glass shelves, metal racks, wood cabinet space and such much more. This standing bar table provides an additional space to serve guests drinks immediately. 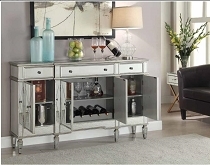 Curio cabinet" 39" L x 41" W x 80 " H, Bar table 39" L x 15" W x 40 3/4 H.
This transitional style white cabinets has glass windows that will allow you to display your collectives. 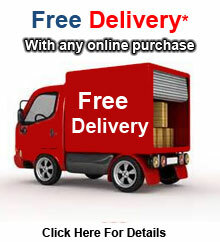 With four large doors, you can safety put away your displays. 47" L x 15" W x 45" H.
This cherry finish curio come in a rich cherry wood finish. 29" L x 15" W x 71 " H.
Our small curio cabinet is elegant and comes in a cherry finish. 32" L x 12" W x 32" H.
Our unique corner curio cabinet come in a deep cherry finish. 22" L x 22" W x 72" H.
This cherry finish curio cabinet is a perfect piece of furniture to with hold and exhibit your priceless possessions. 43" L x 17" W x 84" H.
Our elegant curio cabinet is made from solid wood in cherry finish. 53" L x 21"W x 87" H.
Our traditional style curio cabinet is made from solid wood in cherry finish. It also has 4 unique side doors. 33" L x 15"W x 59" H.
Our curio cabinet is made of solid wood and in a cherry finish. 51" L x 20" W x 89" H.
Our curio cabinet is made of solid wood cherry finish. 47" L x 18" W x 88" H.
Our curio cabinet is made of solid wood and in a white finish. 47" L x 18" W x 88" H.
This small tower display case will help you start showing your treasured collectible items. Cleaning glass is much easier than dusting delicate items, so protect your favorite pieces and display them on four glass shelves. Full surrounding glass case means items are fully visible to enjoy their beauty. The tempered glass is strong so no need to worry that casual incidents will create a break through. A sleek black frame creates a simple accent that is stylish and contemporary for your modern home. Easy push-to-open glass doors leave hardware to a minimum. This small display case will help you start showing your growing collectible items or give you room to spread them nicely through your home. Cleaning glass is much easier than dusting delicate items, so protect your favorite pieces and display them on three glass shelves. The tempered glass is strong so no need to worry that casual incidents will create a break through. A sleek black frame creates a simple accent that is stylish and contemporary for your modern home. Easy push-to-open glass doors leave hardware to a minimum.